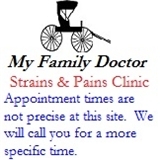 My Family Doctor - Strains & Pains Clinic (Draper) - Book Appointment Online! We provide primary quick care medical services for older children, teenagers and adults at a reduced price compared to urgent care clinics. We can also be your long term family doctor for years to come for continuity of care. Our practice also has an emphasis in preventative medicine and treating neck, back and joint pain. We are a small medical office that values quality personal care. Besides Dr. Hermansen, we have on staff a physician assistant with over 25 years of experience in primary care and orthopedics. THE APPOINTMENT TIMES at this site are not precise. We will call you for a more specific time once we receive your request.